The Shame and Scourge of West Texas–Nana is MAD! I have posted before on the growing problem of homeless families in the Midland/Odessa Texas area. I find it appalling that the number of homeless families with working members is on the rise in West Texas. I am writing a proposal of my own to send to Washington D.C. that will allow the federal government to collect the extra profits from such gouging/profiteering and remove the incentive to raise rents to the point that it is discriminatory against women, elderly and the minority populations. If it doesn’t stop now, the cancer of the working poor living in the streets will only increase. If the states won’t put rent controls in on their own, then it is the duty of the Federal Government to step in and put a stop to this greed. Whether this takes place during a natural disaster (which IS illegal) or a boom, it is an outrage and Texas should be ashamed for not stepping up to the plate to prevent further displacement of its elderly and its families. Even rents on a lot of HUD assisted housing have also increased in these areas. This also needs to be addressed as the owners of such properties are merely making money off of the backs of the poor with this garbage. I am formulating my proposal as I type and will post some provisions I am putting into it in a later post, but there will be some that I would like your comments on. Get ready…Nana is about to go on the warpath against the greed and corruption that is coming with this boom. The property management companies and landlords who are doing this are a scourge and a disgrace to Texas and to the entire nation. It is the duty of America to expose them and this practice and do what we can to put a stop to this outrage! It is affecting our entire state and the children–and when it comes to our children we have a duty to protect them from this scourge! That is my opinion. To those thinking of moving here–you will be lucky to find a place to put an RV in West Texas right now. Good luck! You’ll need it as the prices of rental spaces in the campgrounds are getting out of control too. There are many untold stories out there. Many unmade westerns, many moving true stories that should be on film but aren’t…I want this to change. It s time to bring quality writing and such back to the table. Lately, we’ve seen a lot of great action stories and such, but it is time tread into areas that people fear again. It is also time to use the one tool as a writer we have and that is our “pen” to make that happen. Many use word processors and such, but nothing beats a pen on great paper as far as I am concerned. The pen turns us into a God, Goddess or Wizard–enabling us to manipulate entire worlds and lives without ever hurting a soul. It enables us to share our joy and our pain in ways that no one else (besides those who have been in the trenches with us) can relate to. It also draws readers into tragic worlds of reality, knowing that time cannot be turned back, but lessons learned can help to prevent such events from happening again. I am referring to events such as 9/11, the Manson Murders, the Bath Michigan School Bombing of 1927 (which SOMEONE NEEDS TO MAKE A MOVIE ABOUT~!) Arnie Bernstein wrote a great book about it which one can get at the link below. Then there is the explosion at the school in New London, Texas that killed many–and resulted in odor producing additives being put into natural gas so an odor is produced to let people know that there is a leak. With our pens, our pains and our joys, we create mystical worlds of dragons and knights, vampires and werewolves, faeries and witches. However we also need to write the stories that are true and in danger of being lost. Many of these stories took place prior to when we were born. Others happen before us and seem to get swept from our Historical floor by a society that only wants us to forget them. Well we don’t forget them and we won’t let our children and grandchildren forget them. We will not forget the wrongs done to my ancestors–the Native Americans or the Irish. We will not forget the cruelties endured by “Indentured Servants” and African slaves. We will certainly not forget the Holocaust–which could one day happen again on a different scale. Whatever a writer decides to do with that pen is important. The pen can change lives, inspire and destroy (depending on how it is used). It is for that reason we must write in such a way that the reader will feel good again and/or have HOPE after closing the book or turning off the e-reader and why screenwriters and such should try to enable their intended audience to experience the same thing when watching the small screen or the big one. There are writers of this caliber out there. It is time to awaken the beast or the angel within–depending on their specialty! Food for thought. I was raised as a Baptist and the preachers always talked about how the tongue can kill…Well, perhaps it’s a good thing the pen wasn’t invented yet and that the quill was never mentioned! I am going to work more on this soon. I need to resolve this one! It’s funny how at this time of year, I think of my Grannie Ainsworth a lot. She would start cooking deserts the night before at the latest…I remember those huge tin tubs filled with dyed eggs–and believe me we needed that many eggs! Sometimes more than 30 people who show up and we ate in shifts! Sometimes Grannie invited neighbors in too and there was always enough food to feed a small army! My favorite was porcupine meatballs! Still is! When I look at my grandson right now, I wonder what he’ll remember when he’s older. The girls will get to hunt too! I’m going to be coming back from vacation and will spend Easter Sunday at my mother’s and I’m hoping everyone shows up. Grannie always went to church and then went right back to the kitchen! I remember those wooden pews in the Fundamental Baptist Church and those old oscillating fans–with the red blades and such. I also remember times I sat with her on the back of the truck, eating eggs until I thought I’d explode! I also remember when I was really small that Grandpa Ainsworth helped me get the ones out of the trees because I was too short to reach! But this was my particular program to keep still for! And I always got a kick out of his lady too! She sang about topics nobody would touch! I remember how Mom made dresses for me back in those days too, and I loved them. She’d buy me one for Easter, but the ones she made were pretty cool! I never had the knack for sewing that she did or the knack for cooking she and my Grannie had. I thought it interesting that Grannie could make such perfect things and never use a measuring cup. I never saw her with one until I was older. Once we got through at Grannie Ainsworth’s house–we went for round 2 at Grannie O’Neill’s too! I still remember what a #2 can is and such too. Who else does? Better yet, who remembers those big boxes of commodity cheese or the chicken that the USDA gave out? Now that was some good stuff! My dad made a great batch of chicken and dressing with that chicken! 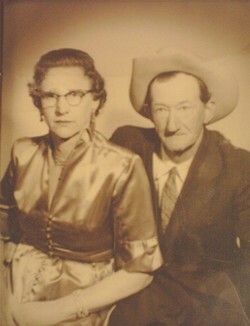 Below is a pic of my Grannie and Grandpa Ainsworth…I miss them both.